Home » France » Paris – A Moveable Feast! Paris – A Moveable Feast! Not many might be aware of French gastronomy having been declared ‘Intangible Cultural Heritage of Humanity’ by UNESCO. But it shouldn’t come as a surprise really, knowing the French obsession with things culinary. Cuisine is greatly valued in many European societies. But the French take it up a notch. Here cuisine isn’t food. It is a tradition. A symbol of culture and national pride. Cities come to a standstill for hours during lunchtime. The subject of les meilleur (the best) wine or cheese or mustard is cause for much passionate debate. Even a simple cup of coffee is meant to be savoured, sitting down at a cafe table, all day if you so desire! No rushed meals on the go here, or God forbid, munching on a quick snack on the walk home! (Except perhaps to nibble on a delicately torn off bit of that baguette you are carrying under your arm!). Come spring, meals are carried outdoors with the ritual and duration remaining as important, if less formal. And ingredients chosen with as much care. That is how I wanted to end my birthday. 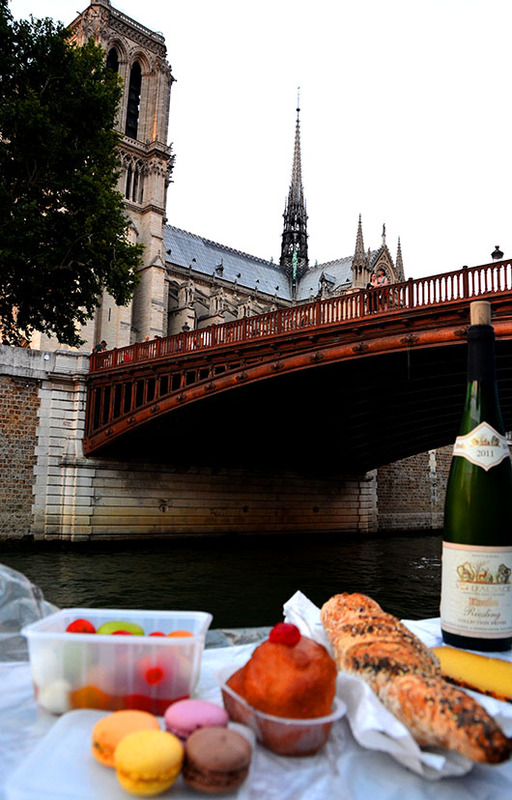 With a picnic on the Seine. The French way. Not a hurried sandwich from a nearby deli, with my legs dangling over the water, but a planned outing with the right components for a perfect meal. So having partaken of a fantastic (despite everything R ordered being better than mine) lunch at restaurant Goust, and exploring a couple of beautiful covered passages, we went shopping for picnic supplies on Rue Montorgueil. Oh yeah baby! We saw buffets that are around only €12. My french meal is one of the most memorable solely because we really dine, as in sit down, relax and took our time savoring the moment while the rest of our group were crunching to see places in our short time there. Very well written as always, Madhu. You have a travel book? Good word, you should! Awww! I”d give a lot to be at your picnic on the Siene. We did one on a park with the Tour Eiffel in the background. It was such a great afternoon up until the sun set. The only damper was a gypsy who kept trying to steal our food…..